Volvo has come a long way from the boxy look of twenty years ago. 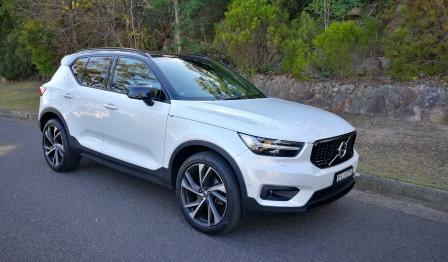 Like most other brands they’ve moved into into the SUV market with gusto and their latest, the XC40, was launched here in Australia in May. 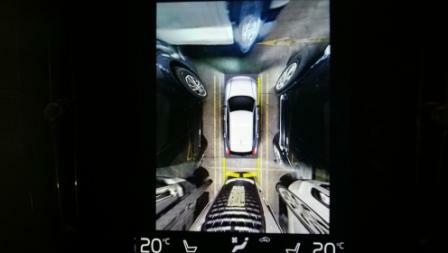 We drive the top of the range R-Design with Launch Edition packaging. It’s a similar external design to its XC60 and XC90 siblings with one marked difference. There’s a sharp angle to the rear of the XC40 that kinks up from the door. Nope, it doesn’t mean rear seat headroom is compromised. A good six foot plus passenger will fit in there nicely. The R-Design offers a colour combination choice inside and out so here there can be buyer customisation. 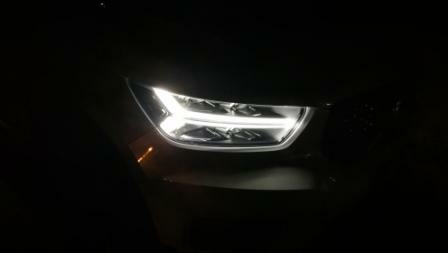 It’s a classy look in the supplied vehicles white body and black roof combination, LED driving lights in the now classic “Hammer of Thor” design that’s embedded into a LED/bending headlight combination. 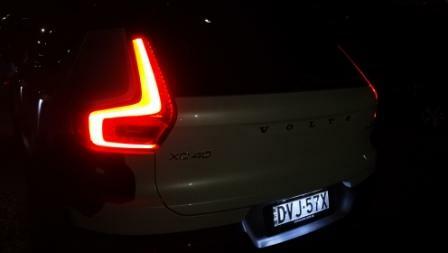 The signature Volvo tail light clusters are LED lit and both ends look superb at night balancing the LEDs in the doors. 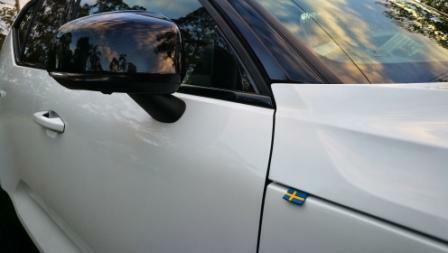 Embedded in the bonnet’s shut line on the driver’s side is a small rubber Swedish flag that commemorates the Launch Edition. 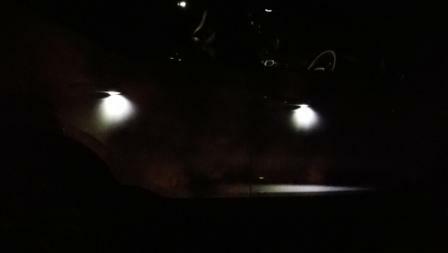 Factor in LED downlights in the door handles and at night it’s a striking look. Power is provided by a silky smooth 2.0L turbocharged petrol engine mated to a eight speed auto. 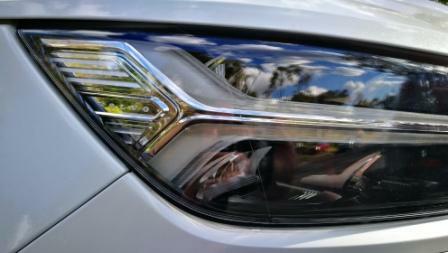 Peak power is 185kW, that’s at 5500rpm, so it’s the 350Nm of twist that makes this thing work. Yep, it’s a standard amount of torque for this size of engine, but it’s the spread over three thousand revs which really sings. 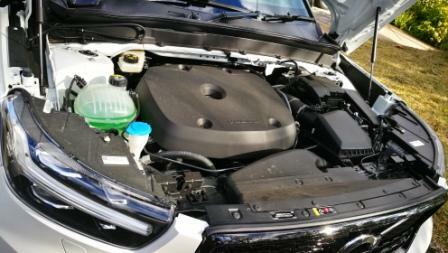 It’s on tap from 1800 to 4800 and meshed with perfect ratios the XC40 R-Design is one of the most usable, driver friendly, cars around. It’s a pity that engines are hidden under a plastic shroud now. The XC40, like most cars now, is a keyless start vehicle. Open the door and the full LCD dash screen lights up, highlights a system checklist, and awaits the driver’s input. Foot on the brake, press the dash mounted starter, and the engines comes to life. 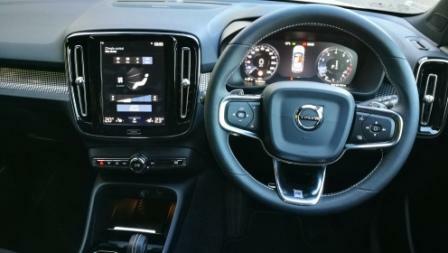 Volvo have gone for a rocker gear gear selector, not a traditional gate style. Once the driver realises it’s a forward/backwards motion and the gears selected (Reverse, Neutral, Drive) show in the right hand dash dial, either a press of the electric parking brake or a gentle stab of the go pedal has the XC40 underway. There’s a Stop/Start system fitted and as effective as it is on shutdown, it’s not completely smooth on startup. Each and every time the engine kicked in the car would lurch, even with the brake pedal depressed. It’s a minor but annoying glitch. Ease away and there’s a bare whisper of engine and the faintest slur felt as the eight speeder does its thing. Plant the right hoof and the XC40’s all wheel drive system grips and slingshots the car forward. 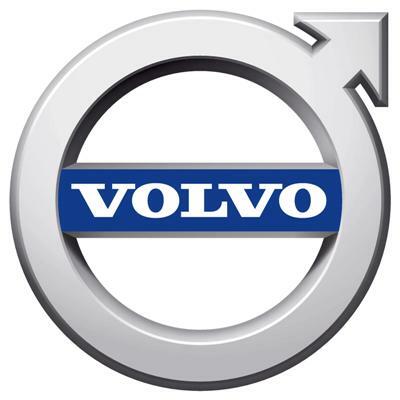 Volvo quote just 6.4 seconds for the 0-100 km/ sprint and that may be a touch conservative. There’s three different notes to the XC40 R-Design. A gentle throttle has the machine move along quietly, almost electric car like. Mid throttle and there’s a purr from up front. The transmission is more noticeable in its changes yet as smooth as calm water. Mode three is when the accelerator is used in anger. That purr becomes a muted snarl, a hint of real aggression comes out, and the changes are sharper, snappier, edgier. 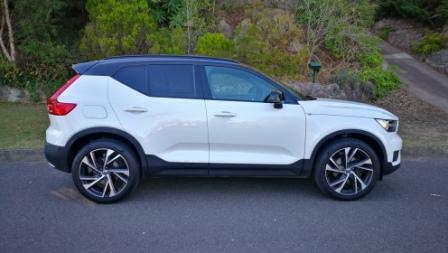 It’s an assertive feeling and one the XC40 R-Design revels in. The XC40 is suspended on the proven combination of MacPherson strut front and multilink rear. They by themselves mean a good ride. There’s sports tuned dampers and 20 inch alloys to consider. Whoa! 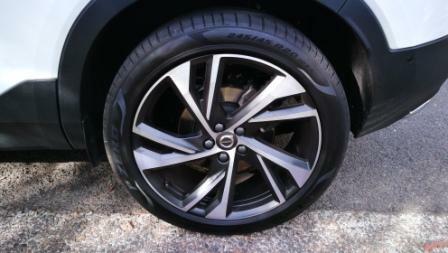 20 inch alloys? And Pirelli P-Zero 245/45 rubber? Doesn’t that mean a hard and uncomfortable ride? Nej. (Swedish for no). Irrespective of road condition it’s supple, pliant, resilient. There’s no bump-thump, no suspension crash, it’s a magic carpet ride. 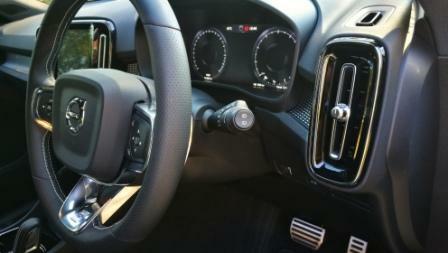 Just ahead of the rocker gear selector is a button for the four drive modes, of which one is Off-Road. This is as likely to be used as Elvis reappearing after 41 years. Tap it though and it changes the look of the dials in the driver binnacle. Actual road noise is also negligible. There’s sufficient insulation as it is inside the XC40. A nice, and sneaky, touch, is the amount of marine grade carpet fitted to the door trims. Intended to provide some grip and support for bottles it also doubles as sound deadening. 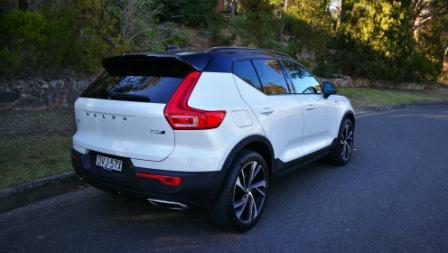 It’s indicative of the careful thought that has gone into the planning of the XC40. 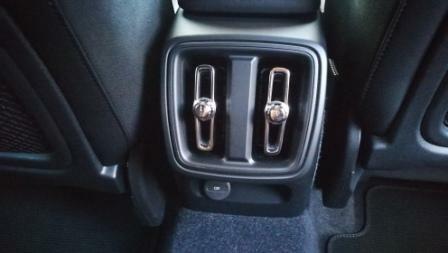 The actual interior handles are subtly spaced away from the door trim to allow for easier pulling. The sound stage has been improved thanks to the simple expedient of relocating some of the drivers. Even the door ‘s arm rests inside have a redesign allowing taller bottles and better ergonomic access when opening and closing. The cargo area is accessed via touch tab or a kick sensor. Normally these tend to be literally hit and miss. The XC40 R-Design’s sensor is a little more carefully calibrated and worked with a proper forward/back kicking motion, not a swipe to the left. The same kicking motion will close it up too. On-road manners are almost superb. I say almost because the steering feels over-assisted and at speed there’s a subtle feeling of twitchiness. Perhaps it’s more related to that aforementioned steering but the XC40 R-Design never truly felt 100% composed on the road. Liken the feeling to having a well trained pup that’s constantly pulling at the lead and you’ll get the idea. Having said that there’s also no lack of confidence in the grip level. There’s plenty of both long sweeping corners and tightening radius curves in which to play in, and the Pirelli rubber shows why it’s famous. The words “tenacious grip” spring to mind and coupled with that sports style suspension the XC40 R-Design can be punted fluidly and hard. Road manners are otherwise spot on. The interior is typical Volvo. That means fit, finish, feel is just right. There’s a hint of old school Cadillac to the flattish dash and Caddy tail-light inspired air vents.The R-Design throws in a smartphone wireless charging pad, a pair of USB ports for the front seats, one for the rear, and heating all around via the three screen touchscreen. That’s typical Volvo and as intuitive as they can be after a bit of familiarisation, a timer to revert to a home screen would be preferred. However there’s no complaints about the sound. the R-Design has Harman Kardon sound and there’s plenty of bass, plus a clarity and depth rarely heard in cars. There’s also a 360 degree camera setup and it looks absolute fantastic. It’s in high definition too so clarity for the driver makes for easier movement. The R-Design comes with six external colour choices including a startling Fusion Red Metallic and a sumptuous Black Stone that goes so well with the R-Design black roof. By the way, Volvo emboss R-Design into the kink and it’s a subtle yet welcome addition. There are three interior grades of trim options. 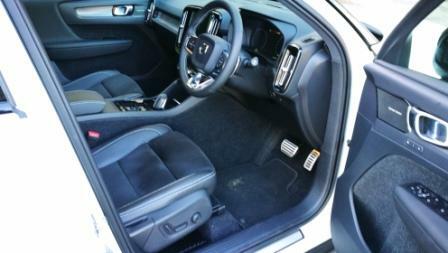 There’s the pretty much standard leather style, a textile and leather, and “Lava” floor and door inserts. An aluminuim plate style inlay is a trim option for the doors and dash. It looks great if lacking in tactility. 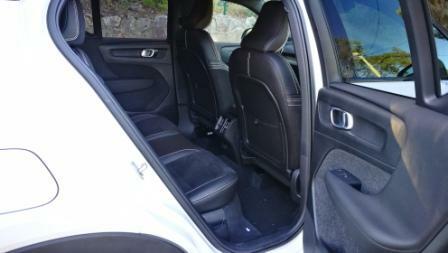 Head room (including the panoramic sunroof), leg, and shoulder room is ample for both front and back seat passengers. 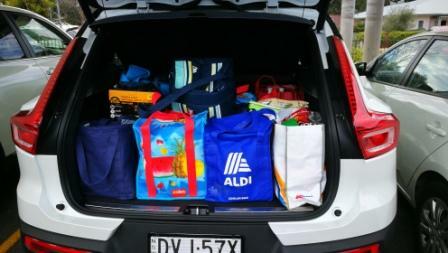 There’s more than enough cargo space for a family and shopping…or scooters…or golf clubs as a certain car show host calls them. Volvo built its reputation on safety and naturally the XC40 R-Design is no different. City Safety is the name Volvo gives to its pedestrian, animal, and cyclist detection system. Bang in Intellisafe which includes Adaptive Cruise Control, Pilot Assist (semi-autonomous driving) and more, PLUS features such as Blind Spot Information, Front and Rear Collision Alert, Run Off Road Alert, and a full suite of airbags and electronic aids and there’s barely time to draw breath. The semi-autonomous system is understated in how it reads the road and instead of a hefty tug it’s a grandma’s hand on the shoulder and a quiet whisper in the ear. Volvo is on a clear winner with the XC40 R-Design Launch Edition. It’s gorgeous to look at, gorgeous to drive, and full of intuition personified. At around $60K it’s a budget price for a luxury package. Buy it. Yes, it’s that good.